Most pets can just jump freely or with the help of their owners picking them up can reach higher spots throughout the home when needed. However, pets are at risk of being injured or having other ailments when they jump, especially as they get older. As well as this, some pets do not want to be carried, and they get annoyed when you help them. Even worse we had a King Charles Spaniel that had once been bitten on one of her back legs; this made lifting her a very uncomfortable experience and one she always let us know about, meaning lifting was avoided when possible. If this sounds familiar than dog steps are the answer. Dog stairs allow your pet to move more independently, thus improving their mobility, meaning stairs can be a great addition if you have older pets within the family or as already mentioned, dogs that are inactive or unable to jump as well as others. So, What Exactly Are Dog Stairs? Dog steps are a small set of stairs made up of about three to six steps to allow pets to reach higher places, such as your bed, the couch, or even your car. Pet steps are more frequently used by dogs purely because cats are more flexible in their ability to leap and jump on to high beds. This guide will look at pet stairs for purchasing them mainly for your dog, but all information given here can also be applied to cats as well. Dog stairs are usually made of plastic or wood and the material used to produce them often directly affects the price you can expect to pay. Dog stairs made of wood are slightly stronger and usually a bit more expensive. Some pet steps also have non-slip surfaces, while the others are carpeted or covered with different types of fabrics. Dog stairs also come in a range different heights, so you should be able to find a product perfect for the level of the surface or object that your pet needs to reach. With a lot of options to choose from, there should be no problem finding the best dog stairs that meet your needs, however, to ensure you choose the right steps for your pet we have put together the following guidelines so you can make the perfect purchase for your home. There is no simple solution for choosing between a set of stairs for your dog or a ramp because each pet and every circumstance is different. With this in mind, dog stairs are the better choice for pets that are used to regular stairs and physically able to handle them. A ramp is a better option if the pet was raised in a single-floor house and has difficulty using regular stairs. The differences between dog steps and ramps are not significant, but it can impact the daily life of your pet. Thus, you must always carefully consider the needs of your pet when making any purchase of this type. Dog stairs are better when you use them next to fixed objects, such as couches and beds. On the other hand, ramps are portable, so you can carry them around while traveling and thus are more suitable for use on the move or if you often switch between different locations both inside and outside of your home. One of the main advantages of dog stairs for bed is that they occupy less space compared to ramps. This makes them ideal great for tight areas or small apartments. While on the other hand pet ramps have their own upside as they are the most natural choice for handicapped and elderly pets. Inclines are gentler on the joints, so they are also great for pets with arthritis or other joint problems, but that isn’t to say cushioned steps aren’t a great alternative either. Some owners often don’t like the idea of having dog steps, but many pet owners are enjoying the benefits they offer. Dog stairs provide solutions to various problems which owners may not like to face up to but as mentioned when it comes to this type of purchase your pet should always be put first. Dog stairs are particularly beneficial for pets suffering from physical limitations like old age, health issues, weight, or size. 1. Great for aging pets – like humans, pets become less active as they age. They may also have a hard time and feel pain while doing simple tasks. Aging pets may suffer from arthritis, joint pain, back pain, hip dysplasia, or other health issues, which make it more difficult and more painful to climb on to beds, couches, and other areas around the house they previously enjoyable cuddling up to their owners or just relaxing on their own. Dog steps can ease the pressure on the pet’s joints and back so that getting to higher places can be easier and less painful for them. 2. Useful for small pets – jumping onto beds and couches can be difficult for small breeds. By doing so, it also poses the risk of injury. Pet steps can help them reach higher places and also reduce the risk of having injuries. 3. Can help overweight pets – like smaller pets, overweight pets may also have a difficulty reaching and getting off beds and couches. If they try to do so, they may hurt or injure themselves. Pet steps offer a simple and safe way for them to get to their destination. 4. Avoid health risks for specific breeds – if you start using dog steps while your pets are young, this may be good for their long-term health. Some dog breeds are commonly prone to specific health concerns. For instance, dachshunds are susceptible to spinal problems. Jumping may cause a shock on their disks. In any breed, jumping puts a great deal of stress on the joints and back, which may lead to a back injury or arthritis. Using pet steps can alleviate these health issues on dogs. 5. Help pets reach high windows – a lot of apartments have high windows that pets cannot reach. When pets are left at home or they just want to look outside, they may become frustrated if they cannot climb the windows. Pet steps are perfect for them in this case as you can simply put them against the wall so your pet can walk up the steps to check the surroundings. 6. Help pets enter and exit the car – some people take their pets with them when they have family vacations or when they simply go out. Pet steps can reduce the stress that your pet might suffer when getting on and off the car. 7. Great for pet training – pet steps can be an excellent way of training your pet to improve household behavior or for professional shows. You can use the pet steps to teach tricks or commands. This way, the pet’s mental capacity will expand. The steps can also serve as equipment for a great muscle and cardio workout. These exercises can enhance the pet’s joint function, strength, and overall health. 8. Beneficial for owners – pets may become bigger and heavier with age. Because of this, it would be useful for the owners to consider buying pet steps rather than picking up the pet. Some pets do not even like being carried. Moreover, some owners may not be able to carry their pet because of back or other health problems or because of the huge size of the pet. Pet steps could be useful for pets to get to higher places without the owner having to pick them up. The simple design of these pet steps offers a soft accent to any room. They are quite sturdy as they can hold pets up to 175 lbs. Another great thing about these dog steps is that it is covered with paw-friendly and durable carpet for added comfort and traction for your pets. If you are looking for pet steps that can save you up some space and can be used for different heights, this is the right item for you. You can adjust them to three different heights, and they are also foldable. For short setting, the height is 16.5 inches, 17.25 inches for medium setting, and 20.5 inches for tall setting. So, you do not have to use separate pet steps for various heights that your pet may want to climb. Then, when the steps are not in use, you can simply fold them and store them away. 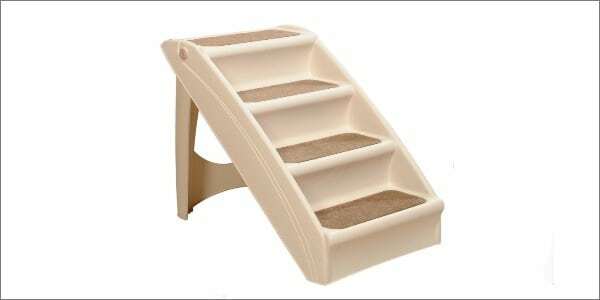 When it comes to quality and affordability, then this item is the perfect stairs for your pet. These stairs are ideal for small and medium-sized dogs. They can hold weight of up to 120 lbs. They have safety side rails to offer more security for your pet while climbing up and going down the stairs. Another advantage of these stairs is that they come fully assembled. What you just need to do is place the extra padding on every step (included in the package). These stairs are foldable, so they are also great for tight spaces and you can also use them for traveling. Some customers complain that the steps are not that soft because they are covered with low-pile carpets. Moreover, there is a risk of the pet slipping on the stairs, because the carpeting is quite small for the steps. The stairs can also be a little shaky, which make it difficult to teach your pet to use them. These dog stairs have a sturdy construction, which makes it great for larger breed dogs as it can hold up to 150 lbs. The steps are made from durable plastic, so unlike foam dog stairs, they will not crumble under the weight of your pet. Due to its lightweight material, these stairs are easy to carry along with you anywhere you go with your pet. You can use them both indoors and outdoors, which make them ideal for traveling. For added security, the base of the stairs has grippers so that the unit is secured on slippery floors. Every step has carpeting so that your pet can get traction. Because of that, they are also less likely to slip while using the stairs. The assembly can be difficult for some people, but if you are handy or you know someone who can help you, you would not have any problem. Most customers who have purchased this product are pleased with how it is easy to assemble. There was one who even commented that they did not even need the instructions. As far as the quality goes, these stairs are sturdy and can hold up to 150 lbs. Security is also considered with these stairs as they have rubber grippers on the bottom to keep the steps in place. The stair landings are wider and deeper so that small dogs can get their whole body on every step and large dogs can easily climb the stairs. This product offers an innovative incline on every step that lessens the amount of steps that pets need to climb, which eliminates stress on your pet. These stairs come with a removable carpet tread that you can remove easily and is machine washable. Perhaps the bonus part of these stairs is that they quite good looking. The advantage of these dog stairs is that they are lightweight, yet it can support a pet that weighs up to 200 lbs. This feature actually surprised some customers as to how sturdy these stairs are. What is even more surprising is that you can also fold them up for easy storage. This also makes it easy for you to carry the item around your home or when traveling with your pet. The stairs are made from sturdy plastic and come fully assembled. All that is left to do is simply attach the carpets onto the steps and also attach the anti-slip claws at the bottom of the stairs. The carpeting helps your pet with keeping their balance and getting traction. Because of the larger dimensions of these stairs, they will suit dogs of all sizes. The product also has small rubber dots for non-skid feet to keep it secure and in place. At first, you may be hesitant to buy this product because of the price tag. While it is not the most expensive pet stairs in the market, you can definitely find items that are much cheaper. However, when you talk about quality, you can never go wrong with these pet stairs. Your dog will surely find it comfortable using these stairs as they are made of high density quality foam. There are no metal frames or wood, which can cause pain to your pets when they jump off incorrectly. The slipcover that is made from 100% polyester can be removed for easy cleaning. The sturdy, waterproof base makes it ideal for any type of surface. These stairs are also lightweight, so it will be easy for you to move them around the house. Perhaps it is just a bonus, but most customers find these dog stairs really attractive. The first thing that you may notice about these pet steps is that they look sturdy, and they really are. In fact, they can hold a pet up to 150 lbs. The hard stairs are under the soft step covers that you can easily remove and wash.
You will not have any difficulty in putting together these stairs as they come with clear directions that you can easily follow. Customers who have commented about the assembly said that they have put the stairs together in a matter of minutes. However, it is not just the assembly that makes these stairs stand out. Customers also find the security features appealing. There are rubber grippers attached to the bottom of the pet steps for non-slip surfaces. These give confidence to your pet when using the steps because they would feel safe. The product is also lightweight, which makes it portable and easy to move. To design these dog stairs, the manufacturer only uses the highest quality foam from the USA. The foam makes the steps gentle on the delicate joints of your pet and at the same time, guaranteeing maximum durability. Security is also a serious matter for these pet steps. They have an anti-slip bottom that provides great stability and make sure that the steps stay in place. The steps are covered with a soft fleece fabric that offers enough traction. This product is also lightweight, so you can easily move it from one room to another. If you are conscious about the look of your dog stairs, there would be something that matches your interior design and color scheme. The fabric covers are available in three different colors as well as animal and paw print designs. You can remove them and change the look of your pet steps because replacement covers are also available.